but not everyone knows that when he was thinking about the theme song for the show he gave danny elfman a tape of a burma shave commercial that zappa had written in the late 50's early 60's and said i want something that sounds like this!!!! also (i havent been able to find any)there are suposedly some zappa album covers in the backgrounds of groenings old comic strip "life in hell"
aside from these 2 points there must be some other things that tie these (2 of my favorite )things together. If the search function here didn't blow, there is a thread here discussing this somewhere. As I recall from the old thread: Nobody could provide any reference to Zappa in the Simpsons show. There was one reference actually, and it was in one of the more recent episodes made. 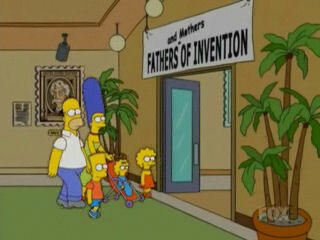 Lisa is taken to a Museum of inventors and the sign at the top of the doorway into the museum said "The Fathers of Invention" with "and Mothers" written just above. That's the only reference I've ever seen. In the opening sequence of four episodes, Lisa plays King Kong very fast on her saxophone. My bad! That's definitely one! But Calvin's "four King Kong"s I have missed. I collect the shows (have the first seven seasons on DVD), so any info on where they may be would be welcome. I have never noticed them. So, you need to get those seasons! I don't want to piss on anyone's firework but this could just be having a dig at political correctness. Thanks. I will indeed get them, but I'll have to be patient. Season 8 is out this Fall (and they release them about bi-anually). Thanks again for the info! Could be....but I prefer to think not. Heh. I used to have a 'Life in Hell' college planner, and there were definitely some comics in that one that showed Blinky the rabbit's room with a stack of records, a couple of Zappa and Beefheart albums among them. I don't have the agenda anymore, but I'm positive this is correct. In another Groening's "Life in Hell" comics, he was talking about his younger life, and he mentioned playing Lumpy Gravy, while high. LISA: And you're obviously Jewish. MR.BERGSTROM: Jewish? Are you sure? "The World's most plentiful ingredient is STUPIDITY"
I USED TO BE VIVIEN O,BLIVION BEFORE THE CRASH, YOU KNOW!!!!!!!!!!! 'The Simpsons' is 30 today. Here's how Frank Zappa hugely influenced the show. hey punk, are you really suing House Oversight Committee Chairman Elijah Cummings? Wow, talk about scary timing! "we may be old, but we've seen all the cool bands"
There would be no The Simpsons show without the Zappa's influence. Cool connection, undoubtly.